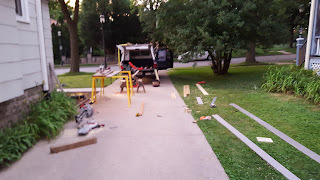 I have learned many things and re-learned a few during the construction of my front steps and walk over the past few weeks. Some are good life lessons, some are project specific and some just address insecurities I have in my own abilities - most of them unfounded. Here are a few of the more obvious ones that jumped out during those long hot hours behind a drill or on the handle of a chop-saw. Measure twice cut once. Better yet, measure twice, line up for the cut and then, measure a third time. Then cut. This goes for life too. Having a plan and checking it along the way helps make the experience go smoother. Not always, but mostly. Cut on the far edge of the pencil line. Along the lines of the previous suggestion, when you do cut your composite board, better to err on the side of too big. It's hard to add length to a cut board, easy to take away. Same goes for getting places on time. Better to be early and wait a few minutes than to show up late because you cut things too close. Two make a better team than one. On more than one occasion, one of the two or three of us corrected another on a detail the person had gotten wrong - a wrong measurement, a detail missed, etc. No man does life well as an island. We need folks walking alongside us, giving advice, checking our errors and occasionally even correcting. These are what good friends are for. Straight lines are good, crooked bad. If you are not using a T-Square and a level, that overlooked angle or off centered piece will compound the problem as you go. If you ignore that problem in your personal life or around your house, it tends to not go away, but heaps more trouble on top of the next pending issue. Deal with the problem when it happens - you'll thank yourself later. When people are helping, respect their time. I am not good at asking for help. 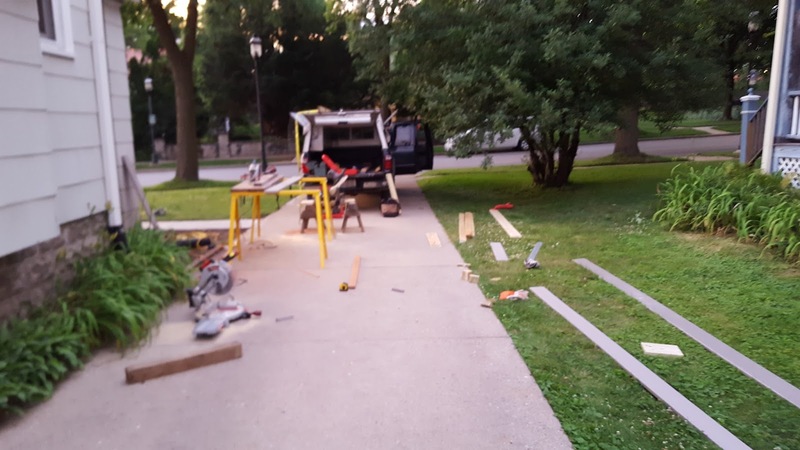 Every once in a while I have a big project like I did with the fence and the steps. Because I know people value their time, I made sure I had things ready, materials bought and lunch and beverages provided. The same holds true for parties, hosting, etc. If you invite people over, feed them, water them, listen to them, then let them go back to their lives. Respect their cues, tell them you appreciate them taking time out of their life to be with you. Thank them profusely. Projects will almost always go over budget and take longer than expected. Everything looks easier on paper. Paper doesn't account for the things you run into along the way. You can plan your day/week/month out ahead of time, but you will inevitably be less productive than you expected because of the co-worker that blathers, the unexpected task, the forgotten appointment, or the hidden cost. Get used to it, it is called life. When you're drilling or sawing, mind your fingers. It's easy to get lazy or comfortable when you've been at something all day. That's when bad things happen. Take frequent breaks to keep yourself sharp. If we remember that our words can be as sharp as a saw, we'd be better people if we watched how we used them. I need help in this daily. It is my biggest sin. Problems that can be hidden are not problems. There are a certain percentage of things in every woodworking project that only the carpenter know exist. They are shortcomings or imperfections that do not matter because they have no effect on the outward appearance of the finished product. Okay, so there is no real life situation where this is a good thing. You got me. So that is my carpentry philosophy that came out of this project. I'm still learning things as I go. One thing that has become clear is that I'm not as big a hack as I beat myself up for. I like perfection but am not a perfectionist. I understand planning, yet fail at planning some things in life. Like this project, and like many people I know, I am a work in progress. I am working on squaring things up, keeping my life level, sanding down the rough edges and trying not to get drilled. It's simply complicated. It's called life.